Chris Tuan, professor of civil engineering at the University of Nebraska-Lincoln, stands on a slab of conductive concrete that can carry enough electrical current to melt ice during winter storms. Tuan is working with the Federal Aviation Administration and other organizations on multiple applications for his patented concrete mixture. A 200-square-foot slab of seemingly ordinary concrete sits just outside the Peter Kiewit Institute as snowflakes begin parachuting toward Omaha on a frigid afternoon in late December. The snow accumulates on the grass surrounding the slab and initially clings to the concrete, too. But as the minutes pass and the snow begins melting from only its surface, the slab reveals its secret: Like razors, stoves and guitars before it, this concrete has gone electric. Its designer, UNL professor of civil engineering Chris Tuan, has added a pinch of steel shavings and a dash of carbon particles to a recipe that has literally been set in concrete for centuries. Though the newest ingredients constitute just 20 percent of Tuan’s otherwise standard concrete mixture, they conduct enough electricity to melt ice and snow in the worst winter storms while remaining safe to the touch. 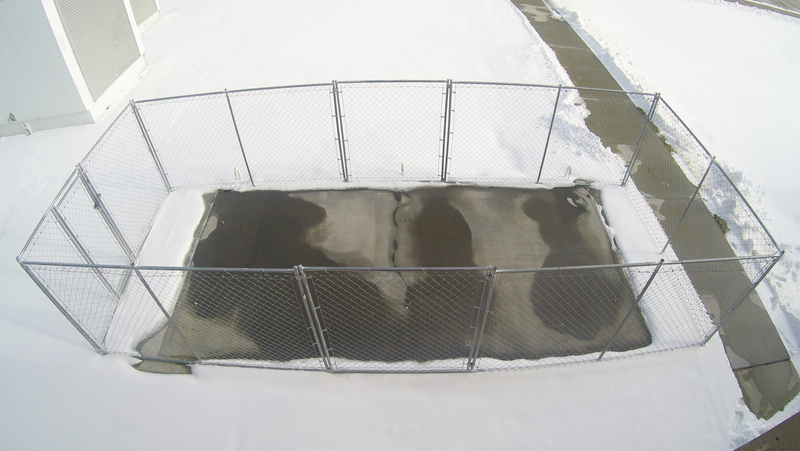 Tuan’s research team is demonstrating the concrete’s de-icing performance to the Federal Aviation Administration during a testing phase that runs through March 2016. If the FAA is satisfied with the results, Tuan said the administration will consider scaling up the tests by integrating the technology into the tarmac of a major U.S. airport. “To my surprise, they don’t want to use it for the runways,” Tuan said. “What they need is the tarmac around the gated areas cleared, because they have so many carts to unload – luggage service, food service, trash service, fuel service – that all need to get into those areas. Potholes often originate from the liberal use of salt or de-icing chemicals that can corrode concrete and contaminate groundwater over time, Tuan said, making the conductive concrete an appealing alternative with lower operating and maintenance costs. The power required to thermally de-ice the Roca Spur Bridge during a three-day storm typically costs about $250 – several times less than a truckload of chemicals, he said. Tuan said the conductive concrete could also prove feasible for high-traffic intersections, exit ramps, driveways and sidewalks. Yet the technology offers another, very different application that doesn’t even require electric current. By replacing the limestone and sand typically used in concrete with a mineral called magnetite, Tuan has shown that the mixture can also shield against electromagnetic waves. The electromagnetic spectrum includes the radiofrequency waves transmitted and received by cell phones, which Tuan said could make the concrete mixture useful to those concerned about becoming targets of industrial espionage. Using the magnetite-embedded concrete, Tuan and his colleagues have built a small structure in their laboratory that demonstrates the material’s shielding capabilities. While Tuan’s collaborations have him dreaming big about the future of conductive concrete, he’s currently enjoying its benefits much closer to home. A slab of conductive concrete demonstrates its de-icing capability outside the Peter Kiewit Institute in Omaha during a winter storm in December 2015. The concrete carries just enough current to melt ice while remaining safe to the touch.